In one of the Republican presidential primary debates the American people were subjected to this past year, Marco Rubio remarked that Democratic hopeful Bernie Sanders would make a “good candidate for president—of Sweden.” This was not a compliment. (Also: Sweden doesn’t have a president.) Rubio could safely assume that Republican primary voters more or less agreed that becoming more like Sweden was precisely not what the United States should be doing. George Lakey disagrees. Lakey, for his part, has been involved in several generations of social change in the United States, often through his Quaker communities—marching against racism in the civil rights movement, sailing a medicine-bearing “peace ship” into the war zone in Vietnam, organizing men against sexism and forging interracial alliances with the Movement for a New Society in West Philadelphia. Since then, he has mentored younger activists as a professor at Swarthmore College, a founder of Training for Change and a member of the the Earth Quaker Action Team, which mounts strategic campaigns against the systems that pollute the planet for profit. I came to know George as editor of his columns at Waging Nonviolence, where he shared stories and lessons from his long experience, attuned to the challenges of ongoing struggles like Occupy Wall Street and Black Lives Matter. One column, published as Occupy’s enthusiasm was beginning to wane, explained “How Swedes and Norwegians Broke the Power of the ‘1 Percent.’” It was one of the most popular articles we ever published—a message of hope that a well-organized population really can transform the economy. 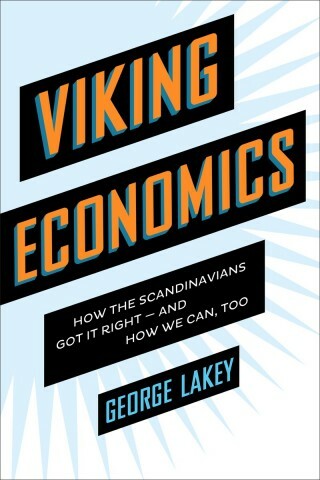 Now, he has published a book-length tribute to the Nordic countries’ pragmatism and spirit, "Viking Economics: How the Scandinavians Got it Right — and How We Can, Too." It insists that those who dismiss the Nordic model, which has produced some of the world’s fairest and most democratic societies, do so at their peril. We once published a widely circulated article about “Viking economics.” What led you to develop these ideas into a book? The yearning to share with my compatriots what’s going on in Northwestern Europe is actually an old one—it dates from when I married into Norway as a young man and studied and worked there. When my wife Berit and I settled in the United States, I naturally wanted to share some of what I learned overseas, since I regarded the Nordic peoples as having created a kind of lab where they could try out new approaches and find out what worked. They made mistakes and also discovered a lot of lessons that were really international best practices, so I assumed people back home would be eager to learn. To my disappointment, my people were defensive, stuck in the belief that only Americans knew how to invent the best ways to do things. Then, when the U.S. banking bubble burst in 2007 and 2008 and people could see we were in serious trouble, I found acquaintances were suddenly eager to hear about anything that worked better. In the meantime, I’d worked in Denmark and Sweden, so I decided to write a book about those countries, along with Norway and Iceland, all of which had ancient Viking ancestry. These countries now have a 60-plus-year track record of remarkable achievements, like free higher education and universal affordable child care and a health care system that takes care of everyone at less cost per person than we pay for a system that doesn’t even meet our whole population’s needs. Those countries even gave up poverty, a huge change from the massive poverty they had before they adopted their new economic model. I think many of us assumed that the Scandinavian welfare state just appeared out of the sky one day, a natural outgrowth of cold weather plus a small and homogeneous population. I actually attack the phrase “welfare state” in my book. Americans imagine that “welfare state” means the U.S. welfare system on steroids. Actually, the Nordics scrapped their American-style welfare system at least 60 years ago, and substituted universal services, which means everyone—rich and poor—gets free higher education, free medical services, free eldercare, etc. Universal totally beats the means-testing characteristic of their dreadful old welfare system that they discarded and that the United States still has. So, properly speaking, in the U.S. context the Nordics should be regarded not as welfare states but as “universal services states.” Nobody has gotten rid of poverty through charity, philanthropy and welfare, whereas poverty can be abolished through universal services. Point taken! So, what made that transition happen? A century ago a majority of the people saw through the pretense of democracy that they had—free elections with a parliamentary system in which the key decisions always took the direction the economic elite wanted. The people then mobilized in several different ways. They formed producers' cooperatives to handle their fishing and logging and farming activities, and also consumer cooperatives to pay less for quality goods and even insurance and housing. At the same time, they were learning how to wage nonviolent direct action campaigns to get specific changes. For example, workers waged strikes in their workplaces. People also learned more about boycotts and demonstrations to use in their campaigns. All of that, plus study circles, produced people’s movements in which people empowered themselves to make their countries genuinely democratic. The economic elite pushed back, of course, even calling out the troops to defend their privileged status. Activists were imprisoned; marchers were killed. Still, the people persevered and made their nations ungovernable by the elite. In 1931 the Swedish Conservative government fell during a widespread general strike and the Social Democrats took over, to rule for decades. People’s struggles in other countries were variations of this, at different moments (as recently as 2008 in Iceland! ), but in all cases it took a major mobilization of nonviolent direct action to force a power shift and give the majority a chance to create what came to be known as the Nordic model. You’re pretty evangelistic about that Nordic model. Does it have shortcomings, too? Norwegians call themselves “a nation of complainers,” and I have friends in Denmark and Sweden who have strong critiques of their countries’ not having gone farther and faster on the road to equality. They say that just because their countries are at the top of the international charts for equality, that is no reason to be smug. Sure, the Nordics invented a system that prevents people from being poor according to the U.S. definition of poverty, which is not being able to count on the basic necessities of life like food and shelter and medical care. I live in Philadelphia and personally know a dad who shared his shoes with his nearly grown teenage son, because between them they have only one pair, and the other one wears sandals or sneakers with holes in them. That’s what I don’t find in the Nordic countries. But they haven’t gotten rid of “relative poverty”—the international definition—which compares people at the bottom with middle income people. Several times, you write about the role of Christian faith to explain the Scandinavian urge to take care of one another. Yet these countries are, in terms of church attendance and theistic belief, among the most secular in the West. That’s not something you write about much. Can you untangle the role of religion here? It’s a complicated story, with variations among the four countries, so I’ll focus on Norway, since I learned to speak Norwegian and know more about the country. Christianity came to Norway because King Olav was converted, which a thousand years ago meant all citizens automatically became “Christian.” It was a state church set-up, paid for by government-enforced taxation, so there was not really that much incentive for religious orders to win the hearts of the people—winning their minds was sufficient. When the state church abruptly became Lutheran, the basic set-up continued, and the lack of people’s everyday practice of faith did not have to be of great concern to pastors. Of course, some religious were evangelical and did reach people’s hearts, thank God, but many Norwegians continued to find more spiritual solace in their communion with nature than inside the church buildings. Some Roman Catholics did manage to keep congregations together, and in recent centuries, Methodists and Baptists made inroads by building congregations where community could be experienced. In some ways the big religious upsurge was the Free Church movement: Lutherans denouncing the state church for being overly attached to its privileges—and also to the most privileged in society—and uncaring about the common people. Free Church pastors integrated everyday concerns with biblical passages in their sermons and urged a piety that became a seven-days-a-week religion. Even while so many Norwegians still found their spiritual nourishment in the wonder of creation, and preferred to go cross-country skiing through their endless woods rather than go to church, the Free Church movement did gain strength and was also more in alignment with the egalitarian impulse of the labor movement and the small farmers who together were largely responsible for opening the political space in which the Nordic model could be invented. If you were to write a sequel to this book on “Viking religion,” or some such, what would the thesis be? The thesis would be that even when the precious movement of the Holy Spirit appears completely submerged in the bureaucracy and worldliness of a state church, it remains alive and able to inspire deeply courageous faithfulness. I would tell stories from the Nazi German occupation of Norway during World War II, when state-church bishops defied Nazi commands and church members helped some Jews escape the Holocaust. I would tell about the Gestapo officer who stalked into the study of a pastor who had been preaching against Nazism, sat down at the pastor’s desk and laid his gun on the desk. The pastor then laid his Bible beside the gun. The officer asked, “Why did you do that?” The pastor replied: “You took out your weapon, and I took out mine.” So many examples! When Islamophobia appeared in Norway in response to increased immigration of Muslims, the Bishop of Oslo attended Oslo’s largest mosque to join the celebration of Eid, the end of Ramadan. When a prominent politician began to promote Islamophobia, a group of Norwegian bishops visiting Israel and Palestine made a point of going to the Al-Aqsa Mosque in Jerusalem’s Old City. Two years later, Norway finally gave up having an official religion. I interviewed a prominent bishop who was visibly relieved, and delighted that he could now meet with other faith groups on the basis of a somewhat more equal playing field. Humility—I believe that has something to do with Christianity. What resonance with your own Quaker tradition did you find in Scandinavian culture? What provocations? An important belief among Quakers is in a “continuing revelation,” that is, that God is still quickening the hearts and minds of his children with knowledge and wisdom that, in earlier times, we might not have been able to hold. Most of the earliest Quakers—in the 17th century—did not see slavery as wrong, and some held slaves themselves. Because the Spirit was alive, tenderizing hearts with what today we might call empathy, Friends came to understand that slavery is an evil practice and, after cleansing their own religious society of the practice, fought (nonviolently) for its abolition. This, to Friends, is not surprising—how can we humans understand at any given moment in history the whole of divine truth? At one point Jesus reportedly rebuked his disciples for not taking more responsibility for their own relationship with God’s truth, and said that it was time they think of themselves as his friends. For me that resonates with Nordic cultures; none of them wants to be frozen in time with yesterday’s partial understanding of the potential of human relationships. Henrik Ibsen railed in his plays against the subordination of women, and the Nordics have become world leaders in changing societal structures to ensure that women can enjoy their full capacity as having been made in God’s image. While the Nordic cultures can teach us much about clearing away the economic and political obstacles to human development so that more people are accorded the dignity they deserve, I don’t find those cultures as broadly encouraging of delving into the inner life and using spiritual practices to do so. The disadvantage of the medieval church’s greater interest in capturing Nordic minds than nurturing their hearts may be that the cultures might have come to value rationality to a fault. As a professor, I have to like that! But as a Quaker, I know we are so much more. Say hello to Trump. If we had such a book Trump would be run out of town.